Rugadh a' Bhànrigh Bhictoria (no Bhioctoiria) air 24 an Céitean 1819 agus chaochail i air 22 am Faoilleach 1901. Bha i 81. Thàinig i gun rìgh-chathair air 20 an t-Ògmhios 1837 agus chaidh a crùnadh mar Bhànrigh na Rìoghachd Aonaichte air 28 an t-Ògmhios 1838 aig Abaid na h-Iar-mhanachainn ann an Lunnainn, Sasainn. Air 10 an Gearran 1840 phòs a' Bhànrigh Bhictoria Ailbeart Saxe-Coburg-Gotha agus bha naoinear chloinne aca. Chaochail am Prionnsa Ailbeart air 14 an Dùbhlachd 1861. 'S e am fiabhras breac a thug bàs dha. Fhuair an Institiud Foghlam na h-Alba bann sgrìobhte on a' Bhànrigh Bhictoria ann an 1851. Ré rìoghachadh Bhictoria bha Breatainn Mór na bùth-obrach dhan t-saoghal agus bha Impireachd Bhreatainn a riaghladh an dà chóigeamh cuid dhen t-saoghal. Chaidh Bhictoria a dhèanamh na Ban-ìmpire na h-Innseachan air 10 an Céitean 1876 an dèidh dhan Crùn smachd a ghabhail o Chompanaidh nan Innseachan an Ear ann an 1858 agus bha i na Bànrigh airson 63 bliadhna agus 7 mìosan. Cheannaich Ailbeart an Oighreachd Bhaile Mhorail ann an 1852 air a son agus tha an oighreachd fhathast aig an teaghlach an-diugh. Rugadh a ban-ogha, bana-phrionnsa Bhictoria an siud ann 1887, a' chiad bhall dhen teaghlach rìoghail a rugadh ann an Alba o 1600. Dh'fhuireach rùnaire Innseanach Bhictoria, Abdul Kadir no am 'Munshi' ann an Caisteal Bhaile Mhorail eadar 1894 is 1901. ↑ “Queen Victoria: The woman who redefined Britain's monarchy”. iWonder. BBC. Air a thogail 22mh dhen Fhaoilleach 2019. ↑ “Royal Charter”. Institiud Foghlam na h-Alba. Air a thogail 22mh dhen Fhaoilleach 2019. ↑ “Queen Victoria becomes Empress of India”. Making Britain. Oilthigh Fosgailte. Air a thogail 22mh dhen Fhaoilleach 2019. 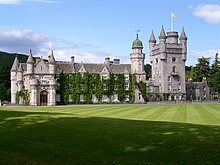 ↑ “Scotland's History: The Balmoral Estate”. Scotland's People. Clàran Nàiseanta na h-Alba. Air a thogail 22mh dhen Fhaoilleach 2019. Air a tharraing à "https://gd.wikipedia.org/w/index.php?title=Bànrigh_Bhictoria&oldid=545214"
Chaidh an duilleag seo a dheasachadh 22 dhen Fhaoilleach 2019 aig 20:26 turas mu dheireadh.